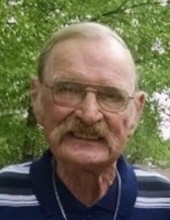 Frank Wayne Rice, 79, of Blue Mound, IL passed away on Sunday, April 14, 2019 in his home. A service to honor and celebrate Frank’s life will be held at 2:00 p.m. on Friday, April 19, 2019 at Dawson & Wikoff Funeral Home, Blue Mound. The family will receive friends for a time of visitation from 12:00-2:00 p.m. on Friday. Frank will be laid to rest in Hall Cemetery. Memorial contributions may be directed to Blue Mound Memorial Library or Cancer Care Center of Decatur. Frank was born on September 9, 1939 in Decatur, IL, son of Herman and Nora (Joint) Rice. He graduated from Niantic Harristown High School in 1958 and enlisted in the Army shortly after. Frank married Cathy Bafford on June 20, 1964. Frank worked at Caterpillar from 1964-2014 (50 years). He enjoyed showing horses, fishing, country music, the outdoors, his garden, telling jokes and dressing up to entertain friends and loved ones for all occasions. "Email Address" would like to share the life celebration of Frank Wayne Rice. Click on the "link" to go to share a favorite memory or leave a condolence message for the family.